"The Mantra for health & happiness"
A whole new dimension of Spa opens up as we learn to touch and communicate with you in a manner that honors your uniqueness and body type. The spa-experience then becomes a context where your true nature can blossom and unfold. Inevitably, this is what each one of us seeks. Our wide range of luxurious face and body treatments are customized product selection and treatment for your body nature. Ayurveda is a science dealing not only with treatment of some diseases but is a complete way of life. This system of science stress on the prevention of body ailments in addition to curing them. This tradition of natural healing system has been a part of culture and daily life in India since the Indus valley civilization (BC. 3000). It is the most natural way to refresh you, eliminate all toxic imbalances from the body, and regain resistance and good health. This is done by applying pressure on the vital points (marma), muscles. The masseur applies pressure with the fingers, thumb or palm at certain points having high concentration of life energy. This massage is superb for overworked, tired, stressed muscles to help stretch the body and alleviate fatigue. One of the most relaxing and refreshing massages that you can enjoy. This is a massage with warm roasted leaf bags after 40 minutes of basic massage from head to toe with Ayurvedic oils / aromatic oils. This is very good for relieving spasm and stiffness of muscles, lubricating the joints, strengthen the spinal muscles and relieves joint pain especially backache. Enhances peripheral blood circulation, cleanses the channels of circulation and expels toxins through the sweat. Massage with Ayurvedic oils for the whole body is done in the first phase of this treatment. This is followed by massage with warm rice (medicinal rice, Navara) bags dipped in milk and a herbal decoction. Oil massage follows as the next phase. This massage nourishes tissues, softens the skin, enhances complexion, strengthens body muscles, cures the stiffness of the joints, and improves digestive power. This is a unique massage of Kerala in which a steady stream of medicated oil is poured on the forehead in a peculiar pattern. This is done after 30 minutes of basic massage for whole body. It is mainly done for relaxing the mind. Very effective for mental relaxation, sleep disturbance, head ache, hair problems and skin diseases. A steady stream of Luke warm medicated milk is continuously poured over the body from a traditional bronze vessel called Kindi in a peculiar pattern while the body is simultaneously massaged. This massage softens the skin and improves complexion and has a rejuvenating effect. This massage is good for proper blood circulation of the body and relaxation of mind. Very good for lubricating the joints; relieves pain, spasm and stiffness of muscles & joints. Massage with special herbal powder after 40 minutes of oil massage. This is done like a scrub for exfoliation; break cellulite; deplete the fat, strengthens the muscles. Removes impurities, dead skin cells and stimulate circulation. This prepares the body for further treatments. This is a process in which the body is made to perspire by continuously pouring lukewarm herbal oils in a peculiar pattern followed by gentle massage. This treatment is given for general weakness, arthritis, paralysis etc. Pizhichil is carried out on healthy persons as a rejuvenating process. Spine massage starts with an application of warm herbal poultice after anointing oil. Luke warm oil is allowed to stay on the low back / upper back or neck for 30 minutes in a dam made with dough. This therapy relieves occupational tension buildups, stiffness, spasm, pains and aches. This is very effective for sciatic pains and spondylosis. This massage is designed to relieve the stress and strain due to long journeys. This is helpful to relieve the muscle pains and aches, swelling on the feet, headache, sleep disturbance, constipation and other discomforts of jetlag. This massage is designed for reducing weight. This includes an herbal powder scrub after an exotic and vaso-dilating massage with warm herbal bags in oil / decoction. Repeated sessions help in over weight. Three to ten drops of herbal juice or medicated oil are applied through nose. This is followed with application of medicated fumes for few seconds. This treatment is highly effective for certain kinds of headaches, sinusitis, facial paralysis, mental disorders, neck problems, allergic respiratory diseases etc. Special powder mixed with medicated oil applying on the top of head for 20-45 minutes. This treatment is effective for ENT problems, insomnia, migraine etc. This is a process of medicated fumes applied to the ears for 5 to 10 minutes, after putting medicated oil. 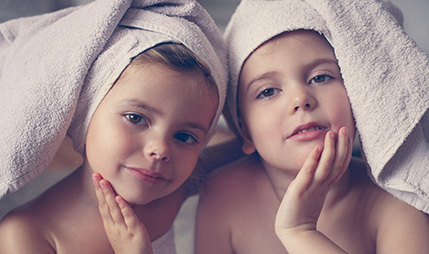 This process helps to clean the ears and avoid ailments associated to the ear. There is not usually time for a full face and head massage as part of a full-body massage. You might like to try it on its own or in combination with a neck and shoulder massage. 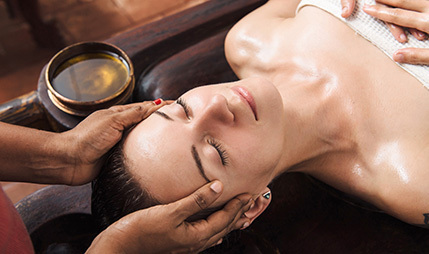 Let the ancient tradition of Ayurveda calm your mind, as we cleanse and balance skin. This utterly relaxing facial will soothe your senses, while treating skin with a blend of essential oils. This includes an Ayurvedic cleansing, steaming, face massage and face pack. Various oils/creams and face packs are used according to the skin type. Ayurveda recommend daily use of a natural kaajal and collyrium for the health and beauty of eyes. This includes putting herbal eye drops in the eyes and an eye wash with herbal water. Reduces puffiness and disperse congestion. A gloriously relaxing yet invigorating experience. Let our therapist iron out the stress and strains of life as she massages the scalp - one of the main tension holding sites of the body with or without Ayurveda oils in the traditional Indian style. For many people, the neck and shoulders are common areas of soreness and tension. Working at a desk or a computer all day helps to create such problems. This massage with or without herbal oil relieves your tension build ups. In this treatment fresh herbs are cooked in ayurvedic oils and packed into bags, which are applied over the neck and shoulder after hand massage. This relieves the spasm and stiffness of neck, shoulder and upper back muscles. This is very effective for cervical spondylosis. Our legs and feet frequently get ignored and small twinges and discomforts often go unheeded. Massage provides the means to ease these tensions and revitalize this weight-bearing part of the body. 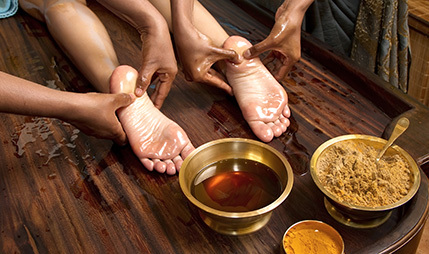 Feel the joy of pampering in the soles of your feet and the very tips of your fingers with exotic rituals. In this treatment fresh herbs are cooked in ayurvedic oils and packed into bags, which are applied over the legs and feet after the traditional hand massage. This relieves spasm, stiffness, muscle cramps, sciatic pain, and knee & ankle pain. This massage improves lymphatic and blood circulation and effective on swollen feet. From the perspective of Ayurveda, losing weight is not about starving or suppressing the appetite. It is about balancing your fat metabolism. You don’t have to starve yourself or exercise until you drop. Balance is the key and with a therapy which is tailor made to suit your constitution. 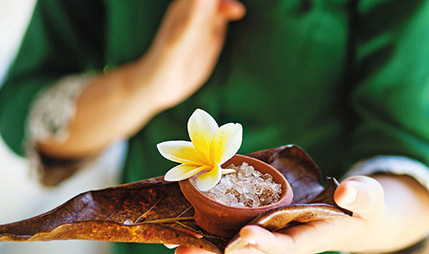 Treatments include body massage by special herbal powders and internal herbal medicine. There can be a possible weight reduction of around 2-3 kilos in 1 week. Nourishment of the tissues like blood, muscle, fat, bones, nerves, etc. are affected by poor eating habits, digestion and metabolic functioning. The result is that foods are not digested and properly eliminated. Undigested foods become toxic waste in the body and hamper the natural absorption of nutrients. Through this treatment, the wastes are loosened, flow to their sites of elimination and are expelled as urine, feces and sweat. Oil application restores the moisture to the skin, soothes the nerves, strengthens the bones and nourishes the tissues. A rejuvenation technique that causes the entire body to perspire by using medicated rice cooked in herbal decoction and milk and applied all over the body with gentle oil massage. This clears the obstruction in the channels of the body, improves blood circulation, removes wastes from the body, improves complexion, strengthens digestion and restores vigor. It makes the entire body strong, sturdy and well developed. It helps to sharpen the senses.